Where did your goal weight come from? Is it what you weighed when you were 18 or what you think you should weigh based on a chart of “ideal” body weights? Focusing solely on the number on the scale does not take individual differences in body composition into account. Body composition is the distribution of fat, muscle, bone and water that your total weight is composed of. Fat composition increases with age until 50-65 years old when maximum fat mass is reached. Muscle does not actually “replace fat”. However, inactivity can lead to muscle loss and fat gain over time. Exercise is an important component in maintaining a healthy body composition. Less is not necessarily better when it comes to body fat. A certain amount of fat is necessary to cushion and protect our organs and to protect us from the cold. Men have a higher % of muscle mass and lower body fat % than women. The more muscle you have the higher your metabolic rate, which is the primary reason why men have higher daily calorie needs than women. Women need a higher % of body fat for healthy reproductive function. Going below the recommended body fat % for women can result in amenorrhea (loss of menstrual period) increasing the risk for developing osteoporosis. Where does BMI fit in? If the number on the scale does not tell you how “fit” or “fat” you are, what about BMI (Body Mass Index)? Not necessarily either. BMI is calculated based only on height and weight. It does not indicate whether you have excess body fat. Someone with a large amount of muscle could be classified as “overweight” even though they might have a low percentage of body fat. 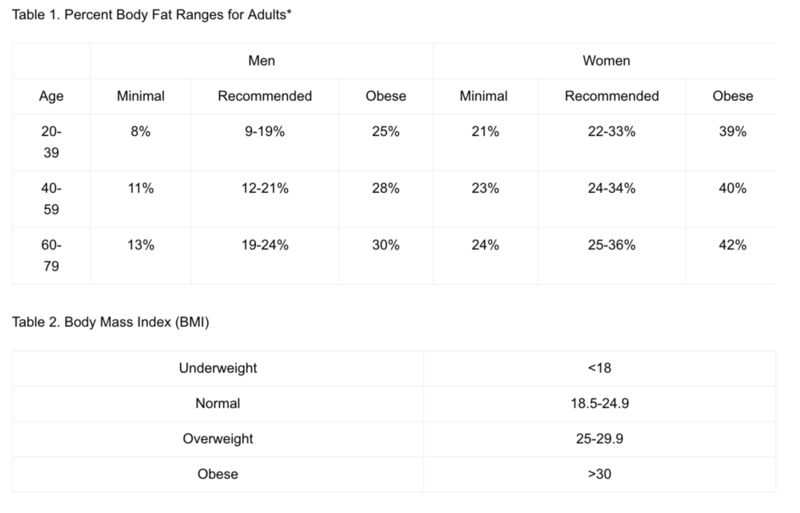 It is also possible that BMI can be in the “normal” range while body fat % is higher than recommended. You can feel overweight or your clothes are tight but your weight has not changed. Your first instinct is often to “lose weight”, although if your weight is in the healthy range, weight loss may not be the solution. Weight bearing exercise increases lean muscle tissue changing body composition and the shape of your body. Muscle takes up less space so your body is larger with 5 lbs of excess fat compared to 5 lbs of additional muscle. It’s not just how much but where the fat is located. Okay so your BMI and percentage of body fat are in the healthy range. You’re healthy then? You have one more measurement to take. Where excess fat is located is an important factor to consider. A waist measurement of <40” for men and <35” for women is recommended to lower risks of certain diseases. Upper body obesity, the android (“apple”) shape is associated with chronic diseases such as high cholesterol, high blood pressure and insulin resistance. The gynoid (“pear”) shape where excess fat accumulates in the hips and legs is associated with a lower risk of metabolic risk factors. The combination of both BMI and waist measurement are a more accurate prediction of disease risk. How do you measure body composition? There are a few different methods to assess body composition. A handheld device or body composition scales are the easiest and most common methods to measure bioelectrical impedance. These scales and handheld devices work by sending electrical impulses through your body — fat, muscle, water and bone all bounce back the signal differently, allowing for an estimate of your body composition. We offer comprehensive body composition analysis at our 136 Madison Avenue location (additional out of pocket fees apply) as well as a free basic body composition analysis at some locations. Don’t focus on the number on the scale. Consider body composition and where the excess fat is located when setting a realistic goal weight for yourself. If you are concerned about health, waist circumference and BMI combined provide a more accurate assessment of health. If your concern is looking and feeling good, exercise is an important part of a healthy lifestyle to build lean muscle mass and maintain a healthy body composition throughout your life. Ross, A. C. (Ed.). (2014). Modern nutrition in health and disease (11th ed). Philadelphia: Wolters Kluwer Health/Lippincott Williams & Wilkins.